Last week we celebrated our 4 year wedding anniversary and enjoyed a week away with our time split between Brighton and a return visit to Chewton Glen's amazing Treehouses in the New Forest. We decided on a return visit to Brighton as I was fortunate enough to secure us tickets to see Ricky Gervais in his new 'Humanity' stand up tour, which just so happened to be taking place on our actual anniversary. It gave us the perfect excuse to plan a few days away and this time I was keen to try out a hotel i'd heard so much about, The Artist Residence. When staying in Brighton we usually go down the Air B'n'B route as we normally have the dogs with us and tend to find these properties more dog friendly than hotels. It actually made a really nice change this time to be staying in a proper hotel with all the little luxuries like a mini bar and having your room serviced daily. After looking on The Artist Residence website and exploring their many different unique and diverse rooms I was quick to decide on one of the Bigger House Sea View rooms which lured me in with its appealing freestanding bath tub. We don't have a full size bath at home so I always like to book rooms with a big tub so I can make the most of the ability to have a long soak and enjoy some of my Lush goodies! The Artist Residence is in such a great location set within the historic Regency Square directly opposite the seafront and the i360, and it's within easy walking distance to the city centre. There's also an underground car park right outside the hotel which made everything so much easier. If you know Brighton you will know that it can be a nightmare to park and when you're carrying luggage you really don't want to have to leave your car too far away. I think my favourite aspect of this hotel is that it's set within a typical Brighton regency townhouse which has so much character and grandeur. Despite being a hotel it also gives you the same feeling as with an Air BnB whereby you feel part of the community and not like a visiting tourist. It's both homely and welcoming whilst also being quite quirky and eccentric with its styling. It's definitely the coolest place we have ever stayed in Brighton. Our room was a great size and I loved the mix of modern rustic furniture with more traditional period pieces. It was also really well equipped with everything we needed including a mini Smeg fridge stocked with a variety of drinks and a vast selection of snacks to choose from. My husband really appreciated the tea and coffee making facilities too as some rooms we have stayed in recently haven't had both and we often miss the ability to make a nice cuppa in the evening. It was really good to see some decent complementary toiletries in the room too which just so happened to be natural and cruelty free. This was again another nice touch and it's more often the little things like this that make a stay at a hotel all the more comfortable and enjoyable. The view from the room also didn't disappoint and if you can I would definitely pay a bit extra to enjoy the sea view. It felt amazing to be able to wake up and look outside the window to be greeted by this view! I'm pretty undecided how I feel about the i360 myself and I can imagine that full time residents and home owners on this square must have been quite annoyed by the new addition to the skyline, but there's no denying that it does make photographs a little more interesting and eye catching. The hotel is also home to the 'Cocktail Shack' which is a great spot to enjoy a drink in the evening. We decided to stop here for a cocktail before seeing Ricky Gervais (which was an amazing & hilarious show btw - definitely see it if you can!). We were there on a Tuesday night so it was pretty quiet but from what I hear this bar is very popular at the weekend. There's also a cafe and restaurant at the hotel but from what I could see on the menu it was pretty meat orientated with limited choice for vegans so we didn't decide to eat there at all during our stay and with so much choice for vegans in Brighton it wouldn't have made any sense to anyway. One night we ordered a Pizza Face Deliveroo to the hotel as we were quite late back and this worked well. It's so good to have the option of Deliveroo when staying in Brighton especially for people like us who don't really venture out much in the evenings (I sound so old!). All in all we had a fantastic stay at The Artist Residence and it's somewhere I would definitely stay again and recommend to others. In my opinion it beats any larger chain hotels by a long shot and it encompasses a lot of what Brighton is about being colourful, arty and fun! The only downside for me is that they don't offer any dog friendly rooms and that would be the only thing to stop us staying there again if we had our fur babies with us. Keep an eye out soon for my new Brighton post where i'll be sharing with you all some of the new places where we ate out vegan on this trip. It doesn't matter how many times I go back, there's always somewhere new to eat out at! 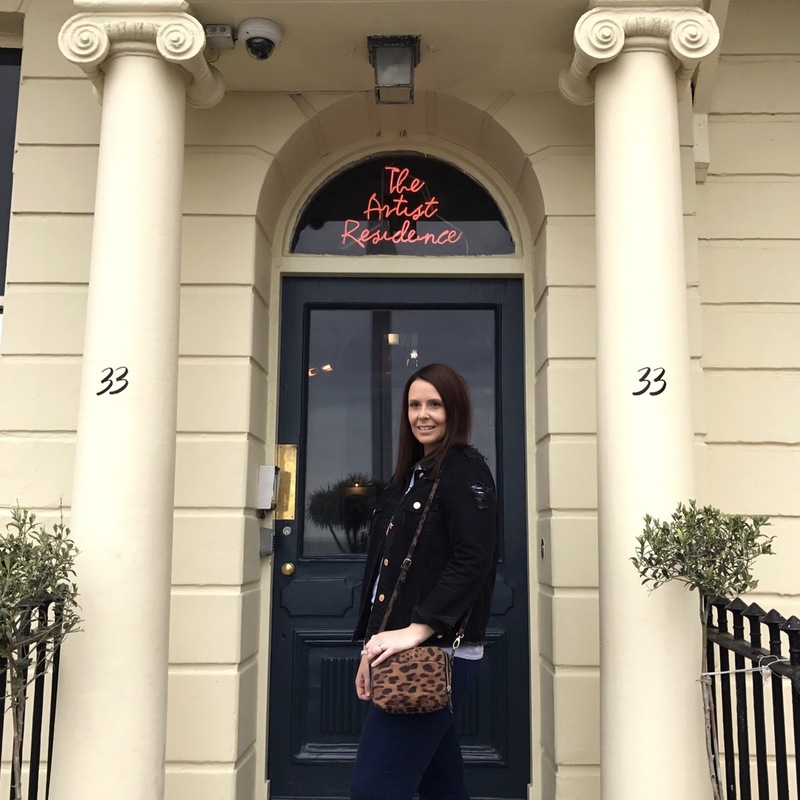 Unsurprisingly I've never stayed at any Brighton hotels or Air B&B's but I often get asked for recommendations so I'll send this post their way next time!